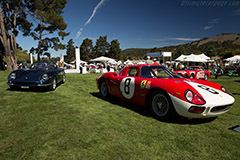 Held at the idyllic Quail Lodge in the Carmel Valley, the annual The Quail, a Motorsports Gathering is one of the more exclusive events during the Monterey Car Week. Although very much a concours d'elegance, the event also offers participants and spectators a superb selection of gourmet food and fine wines, provided this year by six culinary pavilions each inspired by a city that houses one of the Peninsula Hotels. In 2015, the venue was further expanded, and not necessarily to attract more entrants and/or exhibitors but to offer visitors a place to relax and reflect, literally, across the street. To kick off the event, 'The Peninsula Classics Best of the Best Award' was announced. 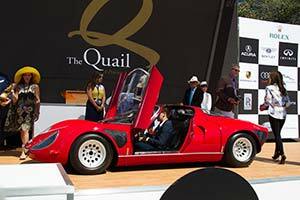 To be awarded at 'The Quail' in 2016, the winner will be chosen from the 'Best of Shows' from six major concours d'elegance from around the world. For us, as always, the focus was very much on the cars and we carefully looked at the eclectic collection of classic and modern cars that formed this year's show field. The result of a hot day's work can be found in this 190-shot gallery. Many high-end manufacturers were on hand at The Quail to showcase their very latest models, some of which had not been seen anywhere else before. Leading the way was the new Lamborghini Aventador SV Roadster, which is the very first open model to be given the 'Super Veloce' treatment. 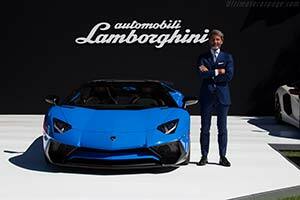 Like the Coupe, which was introduced a few months earlier, production of the SV Roadster will be strictly limited to just 500 examples. BMW used the opportunity to celebrate the 40th anniversary of the German company's motorsports activities in North American by revealing the 3.0 CSL Hommage R show car. Other noteworthy new cars on display were the Acura NSX, the Porsche 911 GT3 RS and the Mercedes-AMG GT3 racer. Swedish supercar manufacturer Koenigsegg made its very first appearance at The Quail, showcasing the sixth and final One:1, which is the only one destined for North America. Other niche manufacturers on hand were the likes of Pagani and Singer. One of the greatest private collections in the world can be found in the Petersen Automotive Museum in downtown Los Angeles. The museum closed its doors in October of 2014 for a comprehensive remodelling of a the former department store used to house the 150-car collection. The work does not only focus on the interior but the building's exterior will also be completely restyled following a design by Kohn Pedersen Fox Associates. The museum will re-open on December 1st, 2015. As a preview of one of the special displays to be shown at the opening, the Petersen Automotive Museum brought three cars to 'The Quail'. 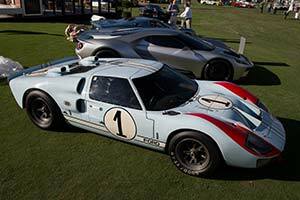 It consisted of three Ford GT models; the GT40 Mk2 that placed second overall at Le Mans in 1966, the Mk 3 GT40 road car that is part of the Petersen collection and the all-new Ford GT due to enter production shortly. The special display will be part of the celebration of the 50th anniversary of Ford historic one-two-three victory in the 24 Hours of Le Mans. Competition cars very much took centre stage at 'The Quail' this year with a special class for long-tail Le Mans racers in addition to the familiar 'Postwar Racing Cars' class. One of the most striking competition cars on display was James Glickenhaus' Ferrari 412 P. The ex-Maranello Concessionaires car was carefully restored by Glickenhaus' mechanic Sal Barrone. Cherished throughout its life, the car still boasts its original chassis, body, engine and gearbox. Another Ferrari of note in the Postwar Racing class was Heinz Swoboda's 348 TB Challenge. This is the car that won the very first Ferrari Challenge race over two decades ago. Further highlights in this class included a very original Alfa Romeo TZ and an ASA 1000 GT that had been prepared in period for the 1965 Targa Florio. The long-tail racers of Le Mans class featured a pair of striking 1980s machines; a Le Mans class winning Mazda 757 and the very last Jaguar XJR-5 built. A true long-tail machine on display was a very impressive Porsche 908/02 Spyder. 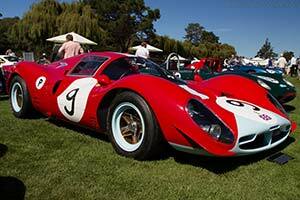 The voting procedure at 'The Quail' is quite unlike any other concours d'elegance as not an independent jury or the spectators picked the winners but the participants themselves. They voted for both the best car in their own class as well as the 'Best of Show' winner. Judging from the eventual winner, the entrants certainly had a keen eye as they picked the Alfa Romeo Tipo 33 Stradale entered by Mouse Motors from Illinois. Regularly described as the most beautiful car ever constructed, it is one of less than ten known to exist. The car combines a competition chassis and drivetrain with a particularly striking body penned by the brilliant Franco Scaglione. This 33 Stradale is now in the running for the inaugural Peninsula Classics Best of the Best Award and certainly looks like a strong contender. Also worth noting was the Spirit of the Quail award, which was given to Joe Leonard for his great contribution to the event; he brought no fewer than nine Moto Guzzis from his private collection. A link to the full list of winners can be found at the bottom of the article. Further refined with an expanded venue, The Quail, a Motorsports Gathering remains very much a stand-out event during the Monterey Car Week. Nowhere else can spectators and participants admire some of the world's best automobiles while enjoying culinary delights like caviar, oysters and champagne. All of the automotive highlights of this year's The Quail can be found in our 190-shot gallery.